Trail description: Tucked away from the centre of Bowness, Cockshott Point makes for a pleasant walk away from the crowds. This lovely setting is ideal for a family picnic or short stroll along the waterside. However, you have to delve a little deeper before finding the real treasure – the path to Cockshott Point later opens up to your right. From here, a short wooded path leads to the shore. Trail Notes: The paths are either pavement or hard surfaced so are suitable for bikes and mobility scooters. 1) Upon leaving Craig Manor turn left in a southwest direction along Lake Road. Keeping to the pavement, make your way along the main road into the bustling Bowness centre. This is the perfect place for a pit stop, with tourists descending on the streets to explore the public attractions, coffee shops and retailers. 2) Here the path levels out to meet a roundabout, where you should take the first left towards the Bowness Bay (A592). There is a little traffic congestion at peak times so care will be needed where the roads narrow and on corners. 3) Pass the narrow roads towards the village square, where you should follow signs for Bowness Bay. After some distance, the route transforms into a sheltered lakeside excursion. The stunning views across Lake Windermere make for a peaceful retreat towards Cockshott Point. 4) The path swings to the right, with several routes leading closer to the shore. With so many different walks to explore, be sure to keep a look out for Glebe Road. Turn right here following marked signs for the lakeside car park. 5) It’s relatively busy here, with locals relaxing on the village green overlooking the lake. Continue along the road towards the lakeside car park and, where the path forks, take the country path in search of Cockshott Point. This route is slightly more satisfying, as you leave the crowds behind and enter a woodland framed by overhanging trees. 6) Cockshott Point is a short distance to the right, but is not easily reached by wheelchair users because it crosses a grassy field. Wheelchair users should use the surfaced path which emerges through the trees and leads to an open meadow. 7) If you are looking for a rest, there are benches a little further upstream where you can admire the stunning views across Belle Isle and watch the boats. After taking in the sights, relaxing and exploring the quieter shoreline around Cockshott Point, retrace your steps back to Glebe Road. 8) At this point you have the option to either follow the route back to Bowness, or turn right for a more scenic route past the lakeside golf course. This is a longer excursion, taking you along Glebe Road and past a Methodist church to your left before reaching the main road. 9) Once you’ve reached the main road, turn left and continue up a gentle incline towards Back Belsfield Road and retrace your steps back to the comfort of your hotel room. Cockshott Point is an area of land owned by the National Trust. It is tucked away from passers-by at the end of Bowness-on-Windermere, and is a lovely place for a family picnic or short stroll along the shoreline. It has long been popular with tourists, and market traders who use the path along the shore. The market traders have gone now and what remains is a peaceful place where you can admire the beautiful views across to Claife Heights and over the west of Windermere. 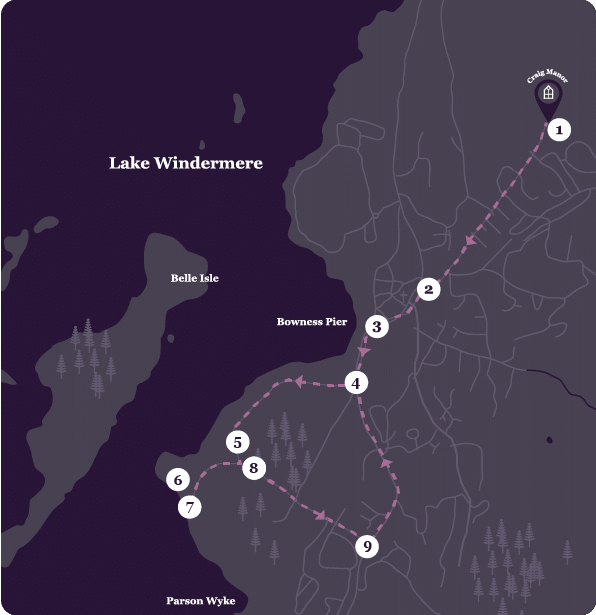 Windermere is renowned for the boats lined up along the shoreline. From here passers-by can take to the water to experience what this charming lakeside town has to offer. The many different options allow you to hire a boat, jump off, walk about or just sit back and take in your surroundings.